As the aggravating rash spread relentlessly across my legs, arms and other areas that will be left unmentionable, to keep this blog format PG13, I questioned if perhaps God was punishing me for possible past indiscretions. Scratching at the burning, slowing expanding rash, I began to review the life infractions against nature and my fellow man that had caused this wrath to befall me. Perhaps it was that October 31st night in 7th grade when we decided to provide Mr. Clark with a Halloween trick rather than a receiving the traditional treat. Or maybe, it was the valiant attempt to out run that police car on the back roads of the Moose Horn National Wild Life Refuge or possibly accidentally peeing on the Marine Patrol Wardens car while passing through the NH Tolls. Regardless of any historical infractions, somehow the universe was attempting to balance my karma by making me very conscious of how good it feels to simply feel good. Ah, Confucius say, “Man who suffer through a week of itching and scratching, quickly learn to appreciate and value the little things in life. 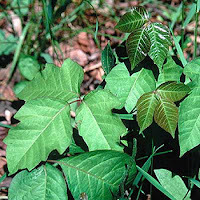 That others not follow my epic journey into itchy self-discovery, I encourage readers to check out the following resources: Poison Ivy, Poison Sumac, Poison Oak identification guides, photographs and treatments. I've never seen any in NW Montana. Wonder what makes us different that Maine? Mom's Island Falls Cure for Poison Ivy - Use "Fels-Naptha Heavy Duty Laundry Bar Soap", the kind with the "The Queen of Clean - Seal Of Approval". It's the yellow cake (non - radioactive) bar..lather it up..spread liberally over the affected areas (be careful in those sensitive Speedo areas) and let er' dry.. I had poison ivy so bad one time that the pus ran off in streams ... who knew it could dehydrate you. 1. Keep hydrated, depending on the severity of your rash. 2. Find some jewelweed, crush up the leaves and stems (juice it), and apply to any affected areas. By the way, jewelweed is also good for sunburn and insect bites. Thanks all for posting your suggestions. It has been a long three weeks but FINALLY the itching is subsiding and the blisters are healing. PHEW! Lets hope I don't go through that again EVER! LOL! I agree with Karen. Bulletin: use heat on that rash, the low heat setting of a hair dryer is ideal. It will itch like crazy for just an instant, then it will feel like you finally scratched that itch. The good effect lasts longer than that from cortisone lotions and creams and certainly costs less. If heat-treated at the onset of the blisters they will dry up and heal in about a week instead of the usual 2. Soaking in VERY hot water will accomplish the same thing for blisters on the extremities, but for those on tender parts, a hair dryer is the thing. I'm not going to laugh at you because I know what your going through. I'm alergic to poison ivy and as I was growing up I use to go for shots every week. That is how alergic I was. I am finally "semi-healed" from the poisoning incurred by that vile weed! Strangely, however, I still have episodes now and then of itching in the effected areas . . . will this never end! !